I just wanted to let you know that. 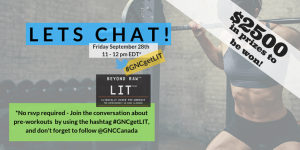 GNC CANADA WILL BE HAVING A TWITTER CHAT PARTY! There will be $2500 in prizes to be won. (LIT pre-workouts and GNC Gift Cards). Prizes are won based on engagement during the chat.